No one buys anything without reading consumer reviews first — and some of the world’s biggest brands have been using that to their advantage. Online consumer reviews have been hijacked by marketers, an issue that culminated recently with the FTC’s rule in a "groundbreaking" case against fake Amazon reviews, according to The Verge. But it’s not just on Amazon — it happens on just about every e-commerce site that feature consumer reviews. In 2016, we founded Fakespot to combat this very problem and bring integrity back to online consumer reviews. 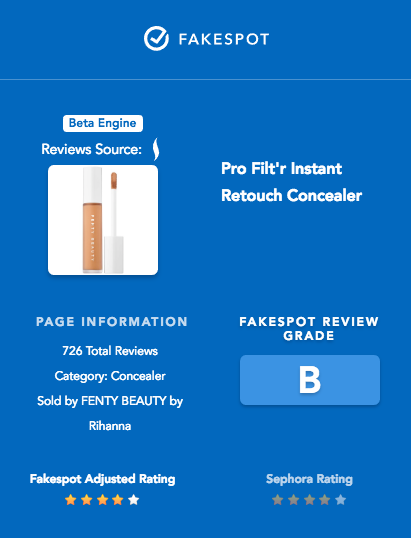 Today, we’re excited to announce a major milestone: Fakespot, which has now analyzed more than three billion online consumer reviews, is adding support for Walmart, Best Buy, Sephora and Steam! Our technology uses artificial intelligence and natural language processing to extract and identify fake and unreliable consumer reviews of products on popular e-commerce sites like Amazon, TripAdvisor and Yelp. Fakespot’s AI powered engines then give each product, service or experience a letter grade (A, B, C, D or F), an adjusted star rating, and the detected percentage of ‘quality reviews’. Through the Fakespot website, Chrome extension and mobile apps for iOS and Android, shoppers can verify the authenticity of online customer reviews before making the purchase. We’d love to know about your experience with Fakespot and suggestions on which e-commerce site you’d want us to add next!